Green roofs are hostile sites for plants because of elevated temperatures and high exposure to wind and light. Selecting the right varieties of plants requires careful consideration of different factors such as location, substrate used, level of maintenance and local climate. Succulents. These colorful plants are commonly found on shallow green roofs in North America and Europe. People prefer to use succulents because of their low growing and spreading habits, tolerance for lack of water, colorful seasonal flowers and textures. Grasses. Most grasses will not survive on rooftop gardens, unless they regularly receive plenty of water during summer. There are same grasses though that are able to withstand extreme conditions during the hot months. Grasses are ideal for covering wide territory and present beautiful contrast to succulents. Herbaceous Perennials. These are non-woody plants with persistent roots and stems below the ground, which allow the plants to thrive and regrow for several years. The flowering perennials are used for display. They are paired with ornamental grasses to create striking contrasts both in form and texture. It only requires periodic pruning for them to maintain their shape. Annual and Biennial Plants. Two groups of annual and biennial plants are used for living roofs—the quick growing annuals and ephemerals and the vegetables. The first group, especially those that come from dry climates, are superb supplements to other flowering plants. However, they require constant irrigation to extend their survival. The second group of annual plants are similarly widely used on living roofs. To prevent these annual plants from becoming weeds on the roof, careful selection of the plants and regular maintenance are advised. Aromatic Herbs. Many varieties of culinary herbs can grow in dry, rocky places and are suited for planting on living roofs. 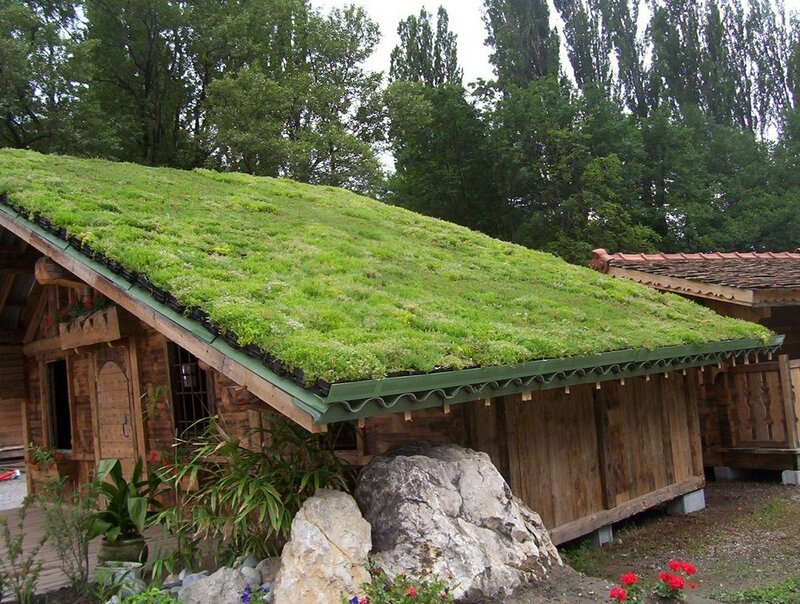 Some have wide-spreading and low-growing covers, which make them ideal for living roofs. Small Shrubs. These are ideal for use on the substrate with at least 250 mm depths. Shrubs often form the bulk of plantings on living roofs with deeper substrates. The create display, cover and habitat. Trees. Trees can be planted on living roofs with substrate depths of at least 600 mm, although a depth of 1,000 mm is ideal. The best types of trees to plant on green roofs are those with high tolerance to heat, flexible stems and sparse canopies.